Mordvin Native Faith symbol, also used as logo of the Erzyan Mastor. The revival of the Mordvin native religion has grown alongside, and with the support, of Mordvin nationalism which started in the last years of the Soviet regime. The revival of the national consciousness of the Mordvins was difficult at first, since they were a minority in their country and the press, which was very influential, took a tough communist line. The Russian democrats and communists were hostile towards Mordvin nationalists. At the start of the reconstruction of a Pagan worldview and religious services reworking folkloric, ethnographic and linguistic study. The Mastorava organisation was established in 1990 with the aim of "restoring the Moksha and Erzya ethnic communities", also fostering a revival of Paganism. The association is officially registered in Moscow since 2002. The current president is Nikolaj Vasilevich Butilov. Ritual preparations for the Rasken Ozks. Mordvin women taking part in Rasken Ozks celebrations. I am strongly opposed to it. In its role as the official state religion of Russia, Christianity suffocated the religions of other nations, transforming them into involuntary spiritual slaves. [...] t is worse than a prison. Sooner or later people get out of prison and become masters of their own fate again. A prisoner is someone who has lost his or her freedom temporarily. But a slave is not a prisoner — he doesn't even desire freedom. Over the course of many centuries Christianity has bred our peoples into slaves, depriving them of freedom of thought and reducing them to the level of submissive cattle. In the Erzya religion the relationship between God and human beings is different from that in Christianity. It is deeper, more humane, more beautiful. [...] In our religion a person's worth is not killed or suppressed, but extolled. You never hear things like "you are God's slave", or "turn the other cheek", or "if someone takes your coat give them your shirt as well", or "bless your enemy". 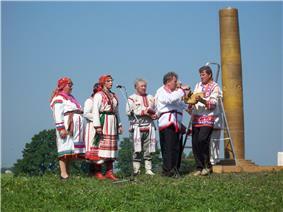 In 1992 Kemaikina organised the first Pagan national ritual after decades or even centuries, sponsored by Mordovian businessmen. Neighbouring villages learned long-forgotten Pagan prayers and Kemaikina was proclaimed the first priestess of the Erzya people. Television reports of that and following national worship ceremonies caused enthusiasm throughout the republic, and now the "Pagan question" is discussed from the remotest villages to university auditoria. ^ Filatov, Sergei; Shchipkov, Aleksandr. "Religious Developments among the Volga Nations as a Model for the Russian Federation". Religion, State & Society, Vol. 23, No. 3, 1995. p. 234. ^ a b Schnirelmann, Victor: “Christians! Go home”: A Revival of Neo-Paganism between the Baltic Sea and Transcaucasia. Journal of Contemporary Religion, Vol. 17, No. 2, 2002. p. 206. ^ a b c d e f g h Filatov, Shchipkov. p. 236. ^ Russian organisations database: Mastorava. ^ Erzyan Mastor website: Christianisation. ^ a b c Filatov, Shchipkov. p. 237.